The USGS defines a landslide to include rock falls, deep failure of slopes, and shallow debris flows. How often do you really think about responding to a landslide? The answer probably depends heavily on the area in which you serve. For instance, responders in the Great Plains area of the United States, the vast area of flat lands covering parts of Colorado, Kansas, Montana, Nebraska, New Mexico, North Dakota, Oklahoma, South Dakota, Texas, and Wyoming probably don’t give landslides much thought at all. It is important to point out though that landslides have occurred in every state in the union. By their nature, mountainous areas are more susceptible to landslides. The United States Geological Survey (USGS) specifically names the Appalachian, Rocky Mountain and Pacific Coastal Ranges and some parts of Alaska and Hawaii as having severe landslide problems. The USGS also produces a landslide overview map that depicts the most susceptible areas. You can access it here. Gravity and its effect on over-steepened slopes is the primary reason landslides occur, but the USGS points out other contributing factors as well. These include erosion by rivers, glaciers, or ocean waves that create over-steepened slopes, weakened rock and soil slopes that are oversaturated because of snowfall or heavy rain, stress created by earthquakes that make weak slopes fail. Additionally, earthquakes of greater than 4.0 magnitude can trigger landslides, and volcanic eruptions produce loose ash deposits, heavy rains and debris flows. Man plays a part in the other contributing factors also when excess weight from accumulation of rain or snow, stockpiling of rock or ore, waste piles, or man-made structures may stress weak slopes to failure. The mud or land sliding is very dangerous as it covers everything in its path, leaving people trapped beneath in a slick, muddy bog of sorts. Debris flow is a killer. These heavy slides often pick up rock, trees, houses, cars and other heavy objects that crush those in its path and tend to block roads, bridges, rivers, creeks and tributaries, causing flooding that takes an additional toll in life and property. 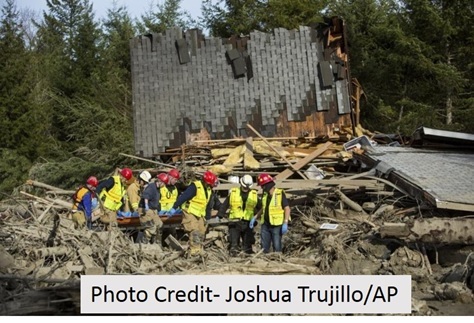 The impact of a landslide can be very devastating as witnessed in Oso, Washington last year where 43 people were killed and over 67 million dollars of damage, response, and recovery costs was done. Nearly 800 responders and volunteers from Snohomish County and the surrounding areas conducted search and rescue and recovery operations, including Navy search and rescue personnel from the nearby Naval Air Station. • Every person who could have been rescued from the mud was rescued on the first day. • All victims were eventually recovered. • The near and immediate availability of helicopter support helped immensely. 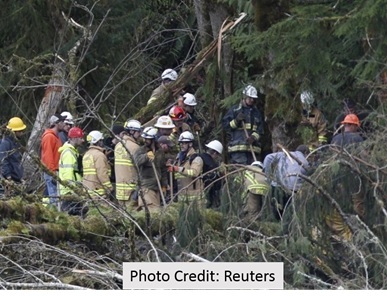 • Volunteer local, state, and federal geologists helped to assess the landslide, address continued risk to responders, and provided mapping and flow modeling resources. • The linkages between people and agencies, citizens, and Non-Governmental Organizations (NGO). • Outpouring of public and private support. Three local tribes stepped up with support. NGOs and privately donated resources greatly helped people whose lives were impacted by the landslide. • The mayors of Arlington and Darrington each assumed mantles of responsibility and initiative, not even vaguely contemplated when they took office. • The Washington Department of Transportation exceeded expectations in quickly getting SR 530 reopened. • Loggers brought essential expertise and equipment for log and debris clearing. Loggers and contractors from Darrington expanded Seattle City Light’s utility access road around the landslide that reconnected Darrington to Oso within 36 hours from the time they began. Sufficient, sustainable funding and cross-jurisdictional coordination for emergency management efforts is vital. The commission understood budget constraints but cited a review conducted by the State of Florida after Hurricane Andrew. The Governor of Florida established the Disaster Planning and Response Review Committee. They evaluated existing statutes, plans, and programs for natural and man-made disasters and recommended improvements to plans and programs for responding organizations, and a request for increased and sustained funding for emergency preparedness and recovery programs. In 1993, the Florida State Legislature voted to create the Emergency Management, Preparedness, and Assistance Trust Fund which provided funding through a $2 surcharge per homeowner’s casualty insurance policy and a $4 surcharge per commercial casualty insurance policy. 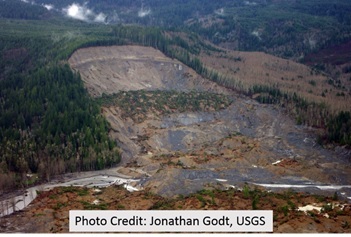 Washington State has few adequate landslide hazard, risk, or vulnerability maps. The commission specifies that accurate geological information, lidar, and robust geological databases for cities, counties, state agencies, and the public is critical to make important permitting, land-use, and other critical regulatory decisions. It states that Geotechnical studies of the Oso landslide area date back to the 1950s, but point out that none were conducted for the purpose of assessing the risks of development downslope, only flooding. The commission also points out that geologic maps and other materials, while commonly published, are not easily accessible to end-users. Recommendations: Support a Statewide Landslide Hazard and Risk Mapping Program, Establish a Geologic Hazards Resilience Institute. Provide Legislative Clarity for the Definition of “All Hazards” Mobilization. This lesson learned is identified as one of the critical first steps and is discussed above. Recommendations: Provide Legislative Clarity for the Definition of “All Hazards” Mobilization, Establish Adequate Funding in the Disaster Response Account. Pro-Active Preparations: The Commission recommends county departments of emergency management take on the responsibility of knowing about the state all-hazard mobilization, knowing how to request the state all-hazard mobilization, pro-actively train and build trusting relationships with regional Incident Management Teams. Command and control must operate and transition smoothly from one phase of the response to the next - so that leadership and management are seamless among and across responding organizations. Recommendation: Activate Washington’s Command and Control Structure for Catastrophic Events. The Commission recommends State and county emergency management organizations work with IMT personnel to develop guidelines and processes that define delegation of authority, resource allocation, and expectations for all-hazard responses between IMT’s and counties during non-fire emergencies. Recommendation: Develop a Standardized Process for Requesting, Tracking, Mobilizing, and Demobilizing Resources. The Commission recommends the State Emergency Management Division develop a standardized process for requesting, tracking, mobilizing, and demobilizing resources. Continue to study and monitor the SR 530 Landslide and adjacent landslides. Recommendation: Conduct Landslide Investigations. The Commission recommends the Department of Natural Resources (DNR) Division of Geology and Earth Sciences, Washington State Department of Transportation (WSDOT), Snohomish County, and the US Geological Survey (USGS) conduct landslide investigations to characterize the mechanisms that activated the landslide and to understand the stability of the landslide mass. Large incidents with multiple fatalities can overwhelm the capacity of local coroners and medical examiners. Recommendation: Prioritize Mass Fatality Management Planning Statewide. The Commission recommends the State Department of Health convene a representative group of county health departments, tribes, and Medical Examiners/Coroners Offices to develop a statewide mutual aid agreement structure for medical examiners and coroners. The Commission also recommends the State Department of Health work collaboratively with tribes, county health departments, and Medical Examiners/Coroners Offices to identify opportunities for improvements to planning for and managing mass fatality incidents, including establishing Family Assistance Centers. Local residents, loggers, contractors, business owners, officials, and many others were invaluable to the rescue effort. Recommendation: Improve Volunteer Process. The Commission recommends the emergency management agencies and organizations that make up Incident Management Teams work collaboratively to develop a process to evaluate and improve both the pre-incident and rapid onsite identification, registration, credential verification, training, and engagement of volunteers. It is important to coordinate with tribes prior to and during an emergency. Recommendation: Deploy Liaisons to Coordinate with Each Impacted Tribe. The Commission recommends liaisons be deployed from state government and predetermined regional coalitions to coordinate with each impacted tribe throughout an emergency. In emergency events, effective communication is challenging. Issues fall into the categories of infrastructure, interoperability, content, and strategy. Recommendation: Activate the First Responder Network Authority. Washington State should actively participate in the design of the FirstNet network, under the leadership of the State Interoperability Executive Committee (SIEC), with the goal of being one of the first states to deploy this new nationwide network. Recommendation: Update the State Communication Interoperability Plan The Commission recommends the SIEC immediately update the State Communication Interoperability Plan (Plan) to include formal certification of Communications Leader and Communications Technician response positions and maintain a State listing for use by incident commanders during a major disaster. Disaster assistance after an event needs a “one stop shop”, in order to help families navigate the various aid systems. Recommendation: Develop a Navigator Program for Emergency Management The Commission recommends the State Department of Social and Health Services collaborate with appropriate stakeholders to develop a regional, standardized Navigator Program for managing survivor needs. Public awareness of the potential negative impacts to property caused by the existence of geologic hazards is important in ensuring the protection of the general public. Recommendation: Advance Public Awareness of Geologic Hazards. The Commission recommends local governments develop public awareness initiatives to inform property owners (e.g. through property tax assessment notices) and the general public of designated geologic hazard areas, once these hazards are identified from local, regional, or statewide mapping programs. The Commission encourages the Washington State Real Estate Commission to include natural hazards awareness - and in particular, landslides - in its “core” curriculum that informs licensees on current trends and issues of importance. The Commission supports the development of educational programs specific to local community issues, to raise awareness of natural hazards and risks from landslides, debris flows, flooding, volcanic eruptions, and earthquakes.